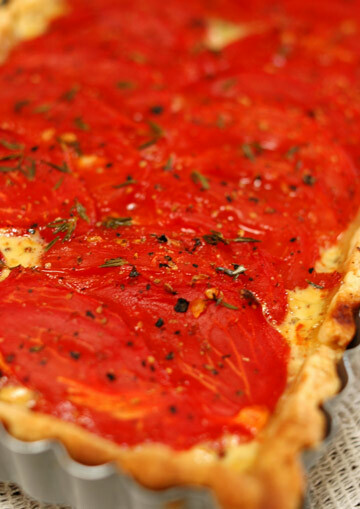 Roasted tomato tart, whose recipe I have kept from a long time ago without a chance to give it a try. Well, here it finally came; it was a very simple recipe - you spread a mixture of creme fraiche and Dijon mustard in a tart shell, arrange some peeled and sliced tomatoes on top, sprinkle with fresh thyme leaves, season with salt and pepper, and bake. Other than making short crust pastry dough, the hardest part must have been peeling the tomatoes, which actually isn't that hard after all. 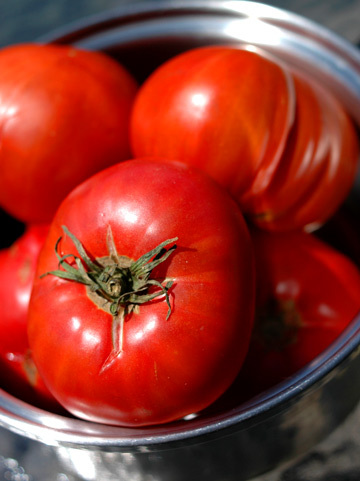 With a dish this simple, what matters the most is the ingredients, which in this case was tomatoes. Since we used ripe, very solid and sweet tomatoes, there was little chance for the whole thing to go wrong, really - and it sure turned out lovely. 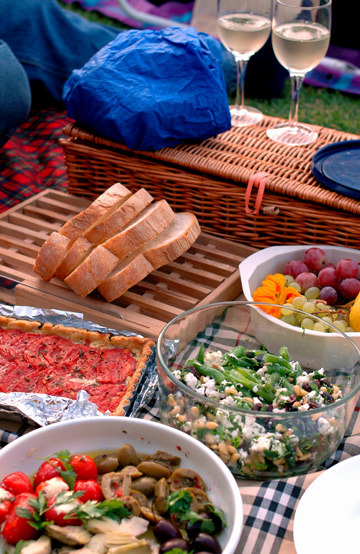 Now, packing up the tart and other dishes along with a chilled bottle of wine and loading the car with blankets and pillows, we went off to the botanic garden near the city center. 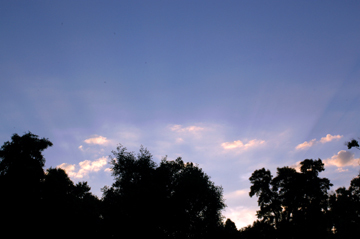 It was about seven o'clock in the evening, but it was still pretty hot, at about 90F. There were already quite a few people there, eating, drinking, or chatting - enjoying a nice evening. 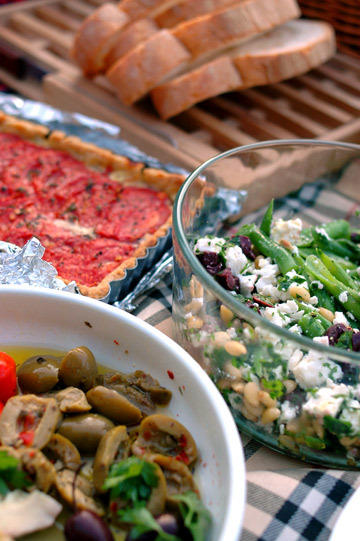 We had a Sauvignon Blanc from a local winery, olives, artichokes, and stuffed small peppers from a deli, grapes, and the tomato tart and a salad which I'd also whipped up for the picnic this evening. For the salad I used green beans that also came from the same family veggie gardens. 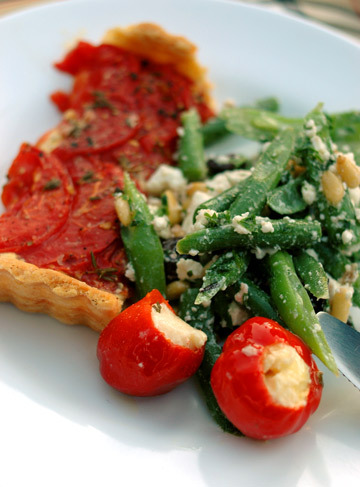 The fresh beans were complimented by feta cheese, Kalamata olives, Italian parsley, and pine nuts, and dressed with olive oil and lemon juice, making a truly summer salad, a good match for the also very summery tart. The tart, by the way, tasted fabulous; it traveled very well as well, and I was even surprised by how the crust hadn't gotten so soggy despite all that ripe and juicy tomatoes. 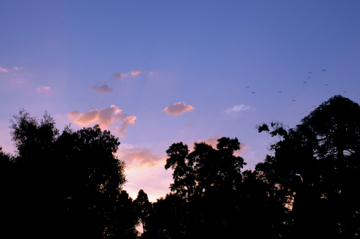 Past eight, the sky and clouds finally started getting pinky. 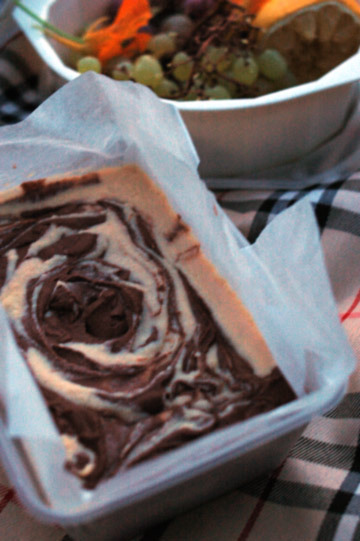 Chocolate marble cheese cake, which by now I have made so many times I can't remember when I made this last time. It's from my trusted book called My French Kitchen: A Book of 120 Treasured Recipes by Joanne Harris and Fran Warde (2003, William Morrow), and actually recipes for the tart and salad I made this time were both from the same book. I found it quite fun to cook a whole meal out of one single book, like I had just done the other day. I think I'll do this again. 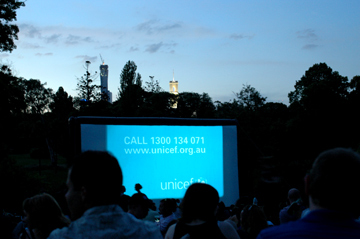 It was an outdoor film screening event called Moonlight Cinema, happening in selected evenings in several major Australian cities over the summertime. I thought it was a brilliant way to spend a long, warm summer evening, and obviously a lot of people had the same idea, specially on a sunny and warm day like this; the place was packed by the time we had finished our dinner. 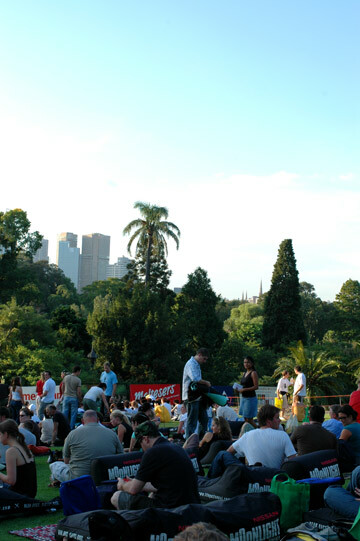 I enjoyed the movie itself, but to me it was more of the whole atmosphere there - it was nice to lazily watch a movie in a large screen, with bright skyscrapers behind the trees and even decently many stars up in the sky. On the way back we dropped by a cafe for a cup of coffee to cap the lovely evening with. I've been having such a good time down here - I feel myself so lucky. maybe not so much lucky as blessed to have good friends who provide good food, good entertainment, and good company :) i hope the rest of your visit is so wonderful! those tomatoes look so inviting... i like 'em fresh and dipped in white sugar just as dad does...weird? yes. yummy? VERY! i couldn't take the picture of the strawberry champagne you made from your last post out of my brain... so, i made my own version. a large scoop of strawberry ice cream and sprite! i think it just needs a touch of lemon. =D strawberry cream float! 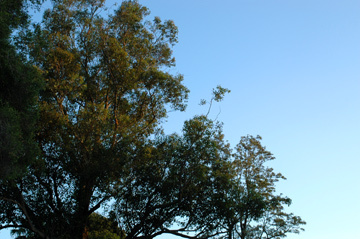 where in aussieland are you, btw? Bring some tomatoes back to Japan! How wonderful-looking! That's really nice! We do the same thing on the National Mall and when I lived in Boston we had "Screen on the Green" in the Common. It's a nice way to spend an evening. Those tomatoes looked delicious! Sometimes simple recipes are the best. 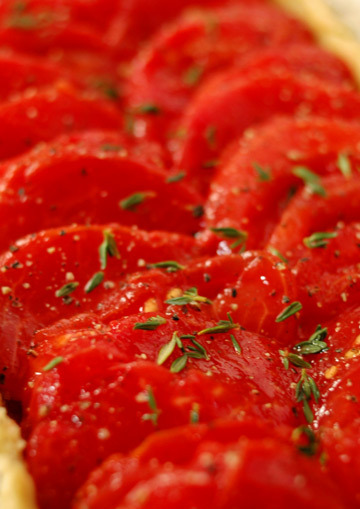 Hi Chika - the roasted tomato tart looks just gorgeous, and those close-ups are seriously inviting indeed. Can't wait till the summer now to get hold of some specimens like that myself! 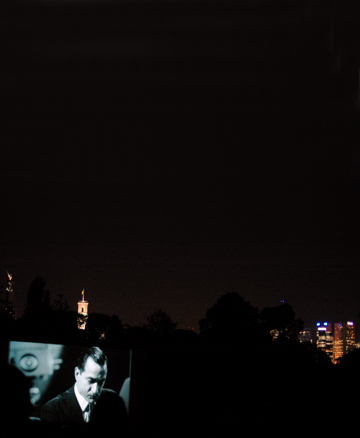 I'm off to the outdoor cinema this friday and am now very inspired. I myself did just that last night with a few friends from work, the food wasn't as glorious, but there was wine and cheese and that was good enough for me. I LOVE your blog! I'm a writer and comedian in Seattle, WA, the home of fusion-foods, mixing cuisines. Love this! Thank you! 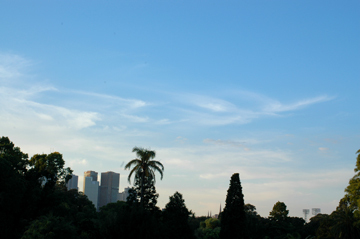 I hope you enjoyed your time in Australia. I have used your photo of the strawberry tiramisu and have credited it to you and your blog. 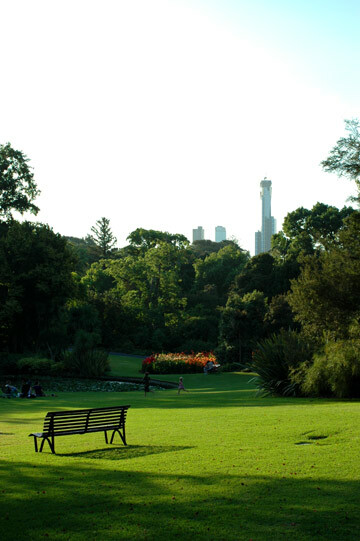 I have recognised the buildings and you were in my home city. I enjoy your blog and hope others will discover it. Absolutely wonderful pictures.Have a great holiday. Hi guys, thanks for leaving a note! Joey - I'm based in Tokyo, I guess, if not nowhere. There're one too many food I'd recommend in Tokyo, but make sure you try soba noodles, tenpuras, yakitoris. Hope you'll catch the cherry blossoms in time! kayenne - your strawberry cream float sounds like a delish! Hanna - oh yeah I would if I could! Liz - Screen on the Green, that's the way! saffron - thanks a lot! anthony - ojama shite mas! :) how did the event do over there? 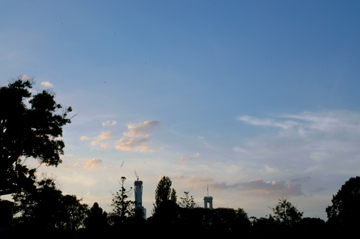 xiaohan - good for you :) food doesn't have to be gorgeous, the atmosphere sure is!